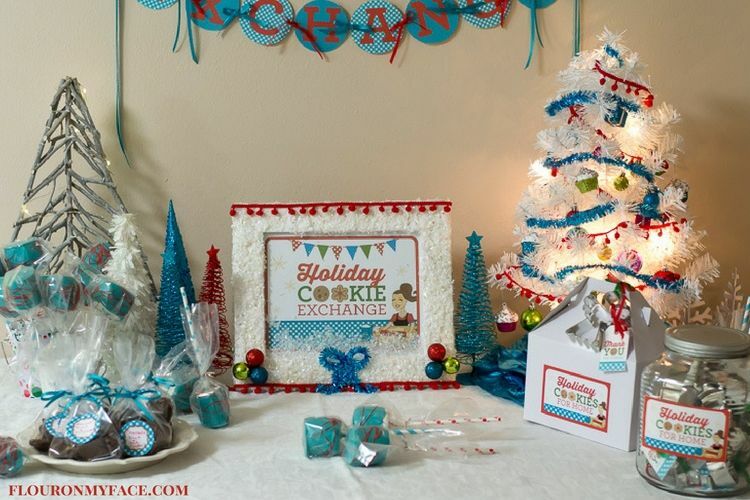 If you are hosting a Christmas Cookie Exchange Party this year you might want to decorate for the occasion. 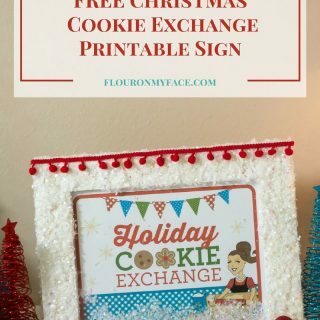 Get this Free Christmas Cookie Exchange Printable Sign that you can download, print out and hang on the wall or put in a festive frame you have decorated to match your Christmas Cookie Swap. Christmas is less than two weeks away! In just four short days I will be hosting my own Christmas Cookie Exchange party for friends and family. 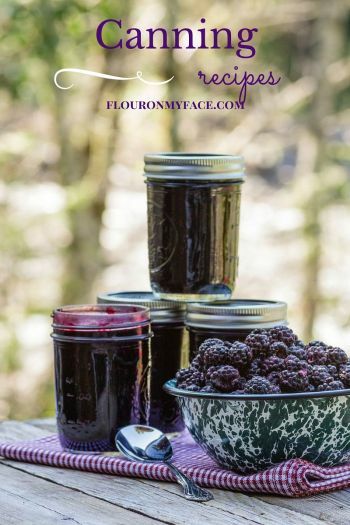 Never hosted a Cookie Exchange? 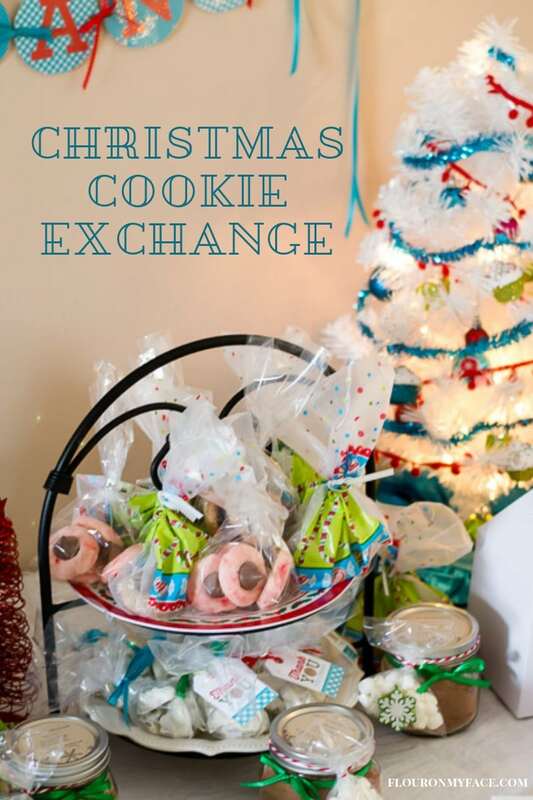 Check out my How To Host a Christmas Cookie Exchange post. I have had so much fun sharing these beautiful Christmas Cookie Exchange Printables with you this year. My Christmas Cookie Exchange was a huge hit. I am so glad we have this wonderful tradition I get to celebrate each year with friends and family. 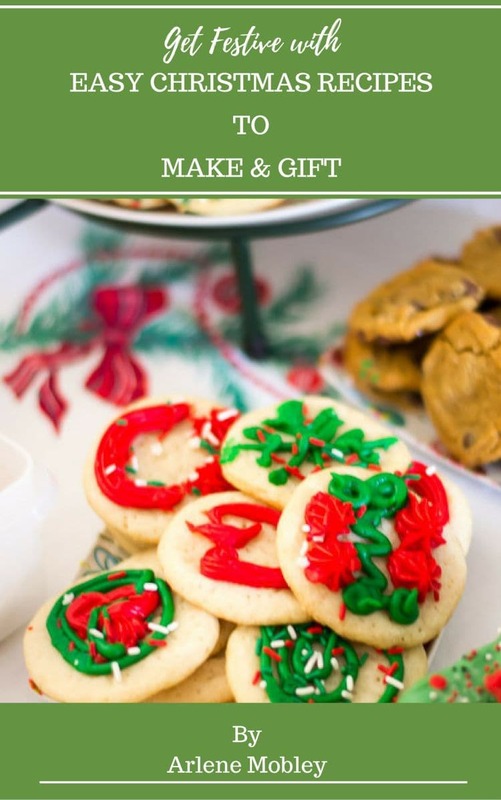 I just had to share this Free Christmas Cookie Exchange Printable Sign and show you how I decorated it. 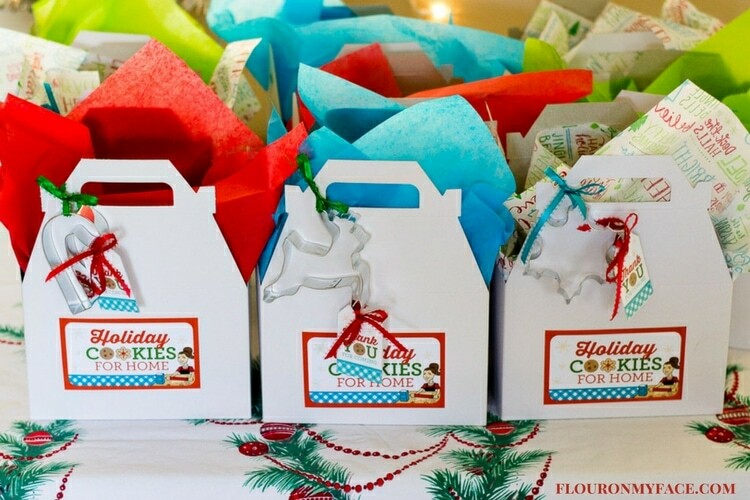 Everyone loved the cookie exchange gift boxes I made. Everyone took one home filled to the brim with cookie exchange goodies. This Snowman Candy stand shows up to the cookie exchange every year! He is the unofficial mascot. 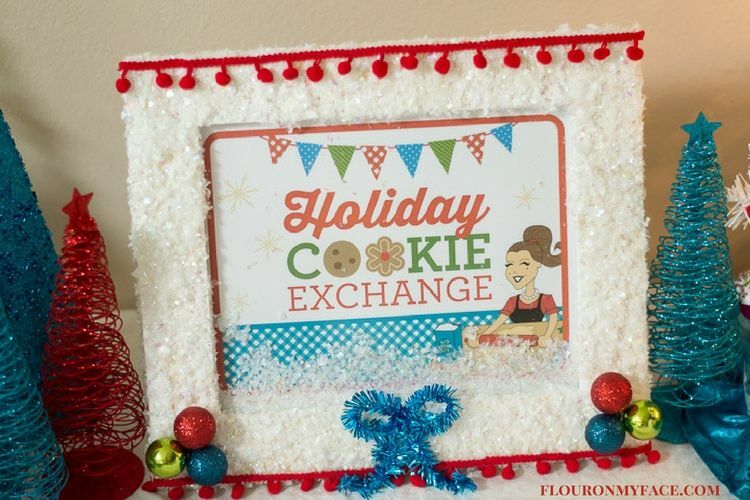 These lovely free Christmas Cookie Exchange printables were custom designed by the very talented digital designer Allison from CanningCrafts.com for the readers of Flour On My Face. 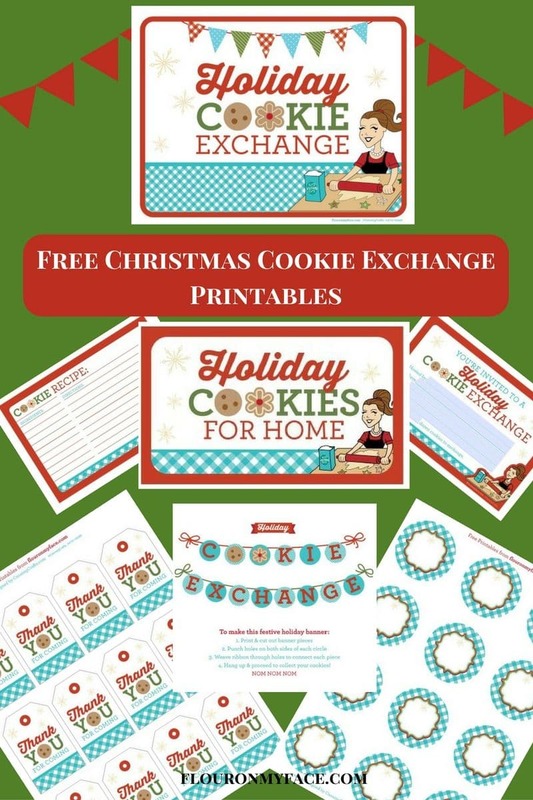 They are all available for download in the FREE Christmas Cookie Exchange Printables Pack here. 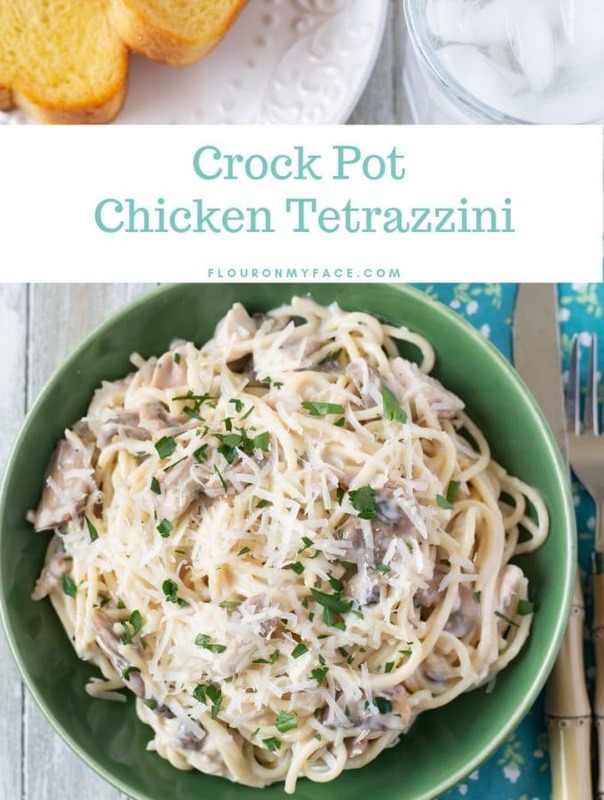 Disclosure: Some links in this post are affiliate links. 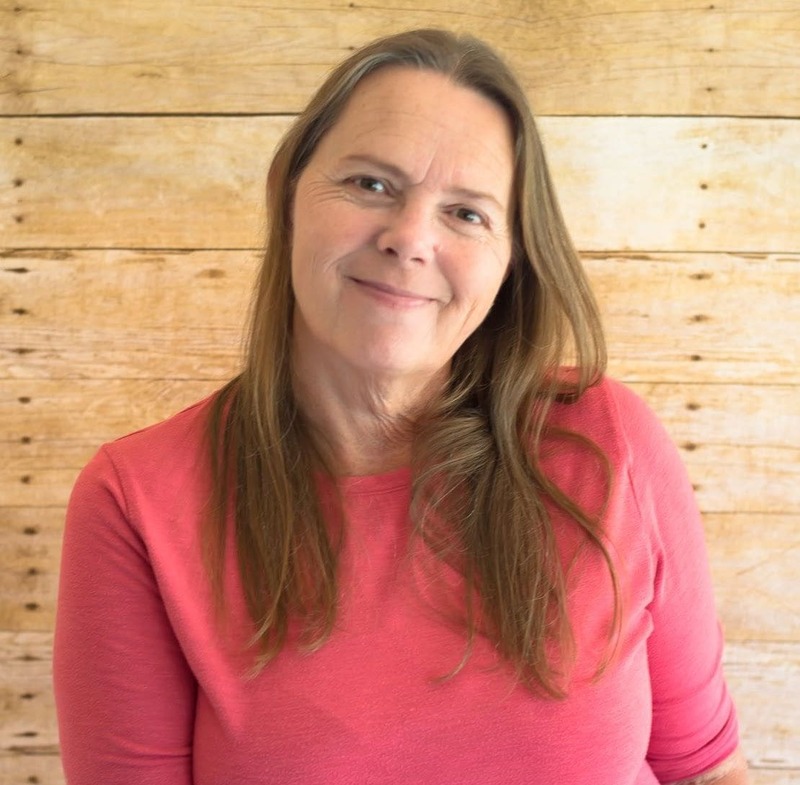 I may earn a small commission if you make a purchase through an affiliate link. 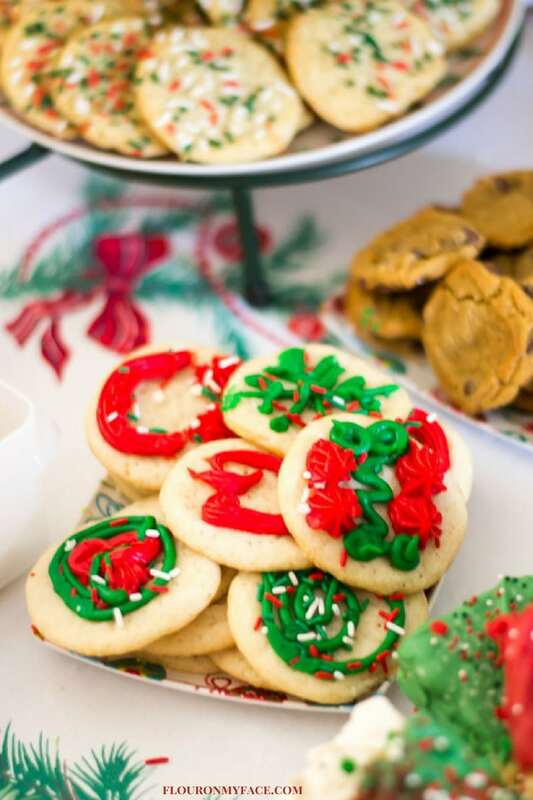 What to bring to a cookie exchange? 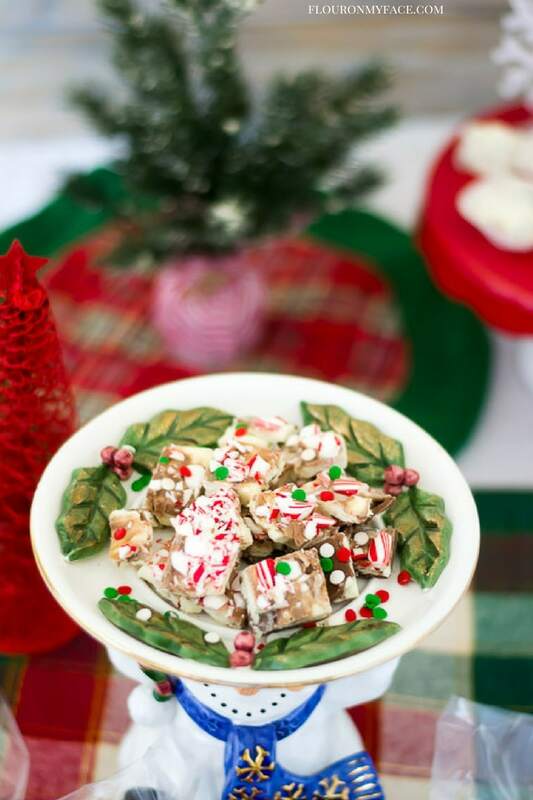 Need a few ideas for cookie exchange recipes? I made these cookie exchange party favors for my guests. I’m making my favorite Cookie Exchange recipe-Cherry Blossom Cookies they look like they’re a fancy cookies recipe but are so easy to make! 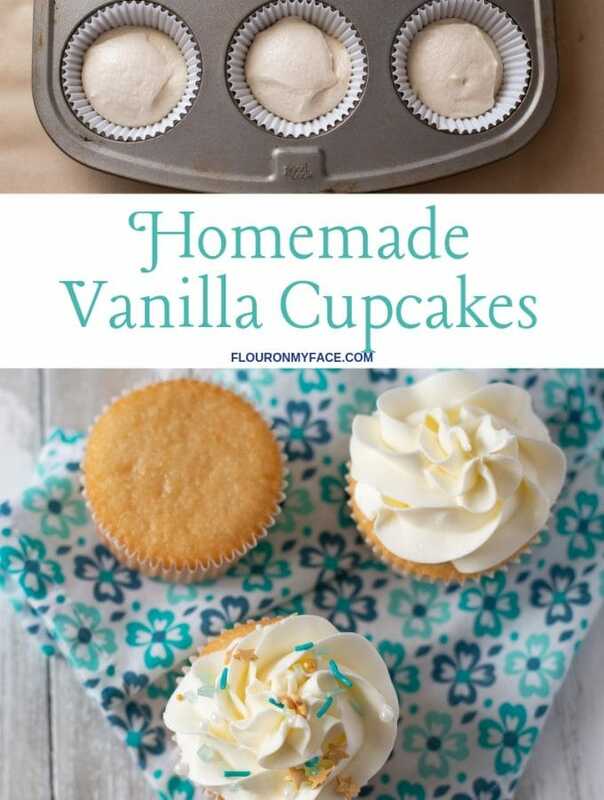 My favorite Sugar Cookie recipe cut out with an Ugly Sweater cookie cutter and decorated. Remove the glass piece from the frame and set aside in a safe area where no children might pick it up and get cut on the edges. Paint the frame with white chalk paint and allow to dry completely. Repeating once for an even coat of paint. Spread the tacky glue over the frame in one section at a time. Sprinkle a thick coating of Buffalo Snow Flurries over the glue and press down with your hand. Allow glue to dry and repeat if needed so all of the frame section is covered in a thick layer of snow flurries. Repeat for all four sided of the frame. Set aside to dry over night. Hold the frame so one edge is on a hard surface. Gently tap the frame once or twice on a hard surface so any unglued Snow Flurried will fall off. Place the frame with the front down on a stable surface. Replace the glass piece. Sprinkle some snow flurries along the bottom edge of the frame. 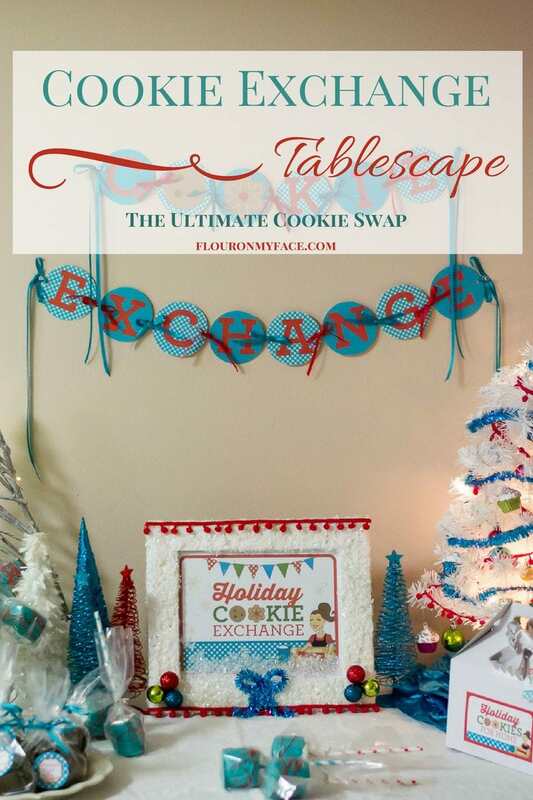 Place the Christmas Cookie Exchange Sign in the frame over the snow flurries. Place the back of the frame in over the Sign. Secure the back with the clips of the frame. Turn the frame over so the front is facing up. In the two bottom corners glue down three mini Christmas balls in colors that match the Sign. I used red, green and blues Christmas balls. Allow the glue to dry completely before moving on to the next step. Measure the red tassel trimming to fit along the length of the frame with about an extra 1/4 inch so you can attach it with glue around the side edge of the frame. Repeat for the opposite edge of the frame. Make a small bow out of the teal tinsel wire garland and glue it at the bottom of the frame in the center. Lay the frame down and allow all the glue to dry over night. 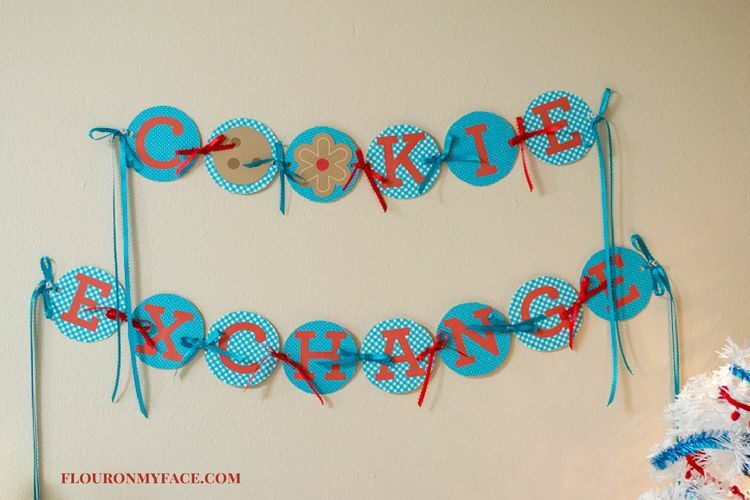 To hang the Christmas Cookie Exchange Sign on the wall temporarily use command hooks. Or stand it up using the stand on the back of the frame. 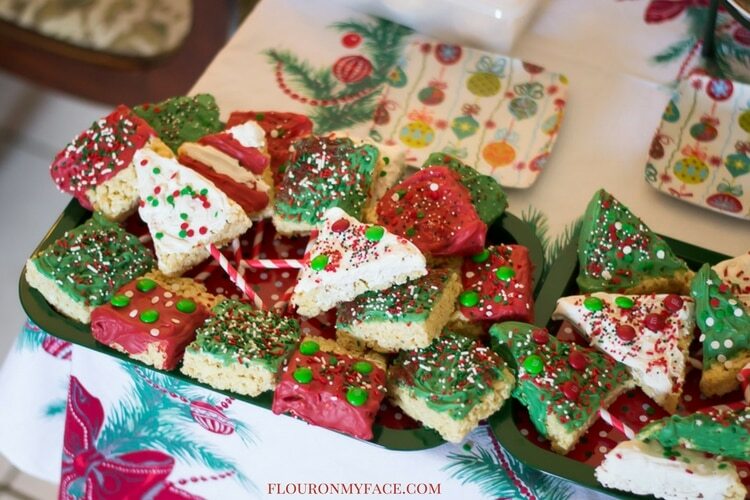 Hosting a Christmas Cookie Exchange? 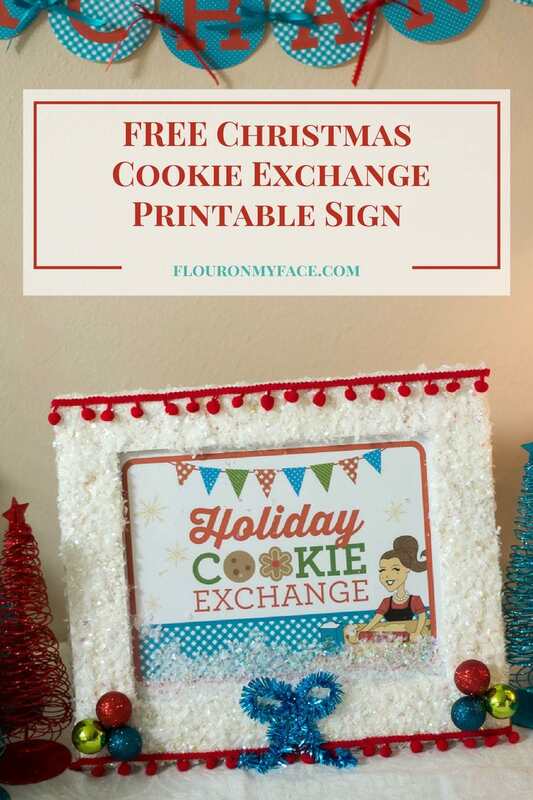 Grab the Free Christmas Cookie Exchange Printables pack designed for Flour On My Face readers. 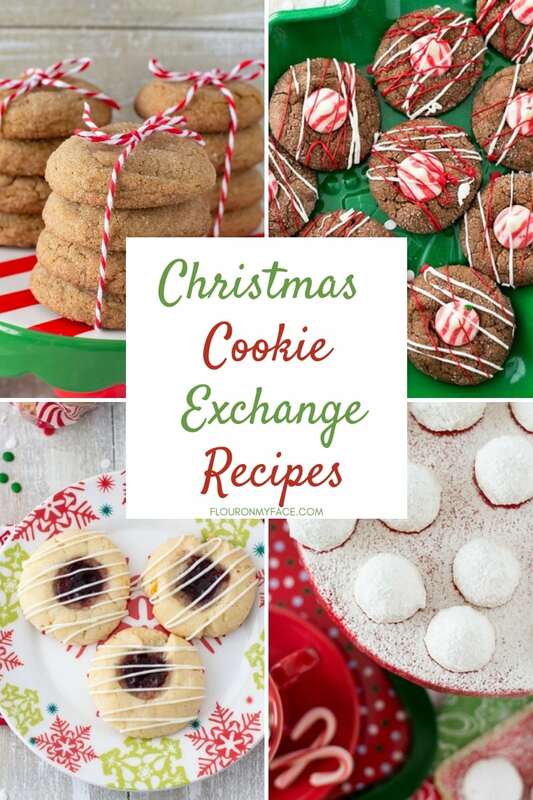 Looking for cookie exchange recipes? 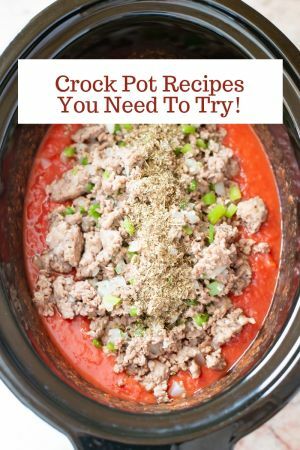 Grab a copy of my Get Festive Easy Christmas Recipes to Make and Gift eBook for $1.99 limited time! I LOVE how you decorated the sign with the snow Arlene! The tassel ribbon is also a nice touch. Thank you so much! You did a wonderful job creating the sign!